The real key to discovering the original recording of Carmen Carmela lay in the discovery of a brief entry in a 1907 edition of Edison Phonograph Monthly. It was a lucky find, and was at first confusing, as the Google search result pointed to an unformatted, plain text version of the magazine. I was simply trying to find anything about the song, so used just the title as the search term. It was only after several pages of results that Google pointed me to the page at the Internet Archive. I thought that I would be able to get a bit further with the number, as I have a list of all known (supposedly) Edison cylinder recordings. The list did not include the number 18526. 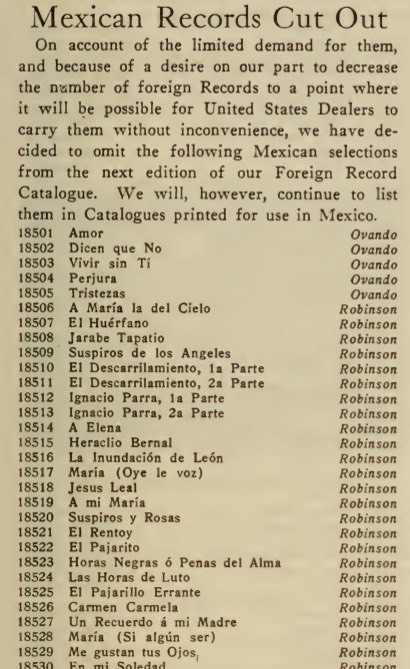 However, it did show 38 recordings made in Mexico, with numbers ranging from 18501 to 18563, all made in May or June, 1904. So, if 18526 simply one of the missing entries in this list, it, too, might have been recorded at that time. I returned to the Internet Archive and searched for Carmen Carmela, hoping to find a mention of 18526, or a mention in earlier editions of the Edison Phonograph Monthly. The first I found was an entry in the January 1905 edition.